RT400 SERIES - AN INNOVATIVE SOLUTION OMEGA’s remote telemetry system for mV sensors provides an innovative alternative to costly cables or wires in difficult installations. 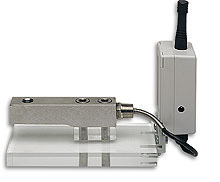 The RT400 system enables remote data acquisition from sensors without hard-wiring. The RT400 transmitter easily interfaces with any resistor or strain gage based sensor and converts the sampled analog signal to digital code. This code is sent to the receiver, via FM radio transmission, where the original analog signal is reconstructed and a scaled output signal is produced. The built-in UHF radio transmitter and receiver circuits operate on 916 MHz and are type approved, allowing license-free use. A fixed compact 1 /4 wave helical antenna is provided on both transmitter and receiver units as standard equipment, enabling line of sight operating ranges up to 200 yards to be achieved. The compact design incorporates miniature microprocessor-based circuitry, which provides 16-bit analog-to-digital conversion and digital encoding for the radio transmission. Using highly reliable designs and including data error detection techniques, data transmission is safe and free from errors caused by interference. The transmitter and receiver units are powered by rechargeable batteries. Battery life can be extended up to 500 hours by utilizing duty-cycle power saving. (A 1000 ½ load sampled every 10 seconds.) Both the transmitter and receiver units are lightweight and housed in a rugged ABS case which provides environmental protection against water or dust to IP65 standards. An 8-way DIP switch sets the transmitter and receiver address codes. The 8-bit address code prevents interference from adjacent sets and up to 256 codes are available. The RT400 Transmitter will interface directly with a Wheatstone bridge sensor. An excitation voltage of 3.3 Vdc is provided to power the sensor. The excitation signal is turned on 60 ms before the sensor output is sampled, then switched off to extend battery life. Bridge sensitivities from ±2 mV/V to ±400 mV/V are available to provide maximum sampling sensitivity. The RT400 receiver reconstructs the signal from the transmitter and produces a scaled output of 0 to ±2.5 Vdc.